Strong growth at LM Wind Power secures 265 new jobs in Gaspe and opens opportunities for wider collaboration with new customers. Gaspe, January 19, 2017 - The expansion of LM Wind Power's Gaspe factory, which last week received financial support of almost USD 5.7 million from the Government of Quebec, is clear evidence of how support for green industries can create new, highly- skilled and valuable employment. The company is open to collaboration for future growth. The new investment, announced at the factory last Friday in the presence of three Ministers of the Quebec government, the Deputy of Gaspe and the Mayor of Gaspe, is a case study in how collaboration between government and industry can yield long term economic growth - especially in regions where a shortage of high value jobs and skills pervades. "The key to success is the pragmatic and strategic view taken by all parties in the project," said Alexandre Boulay, LM Wind Power Plant Director in Gaspe. 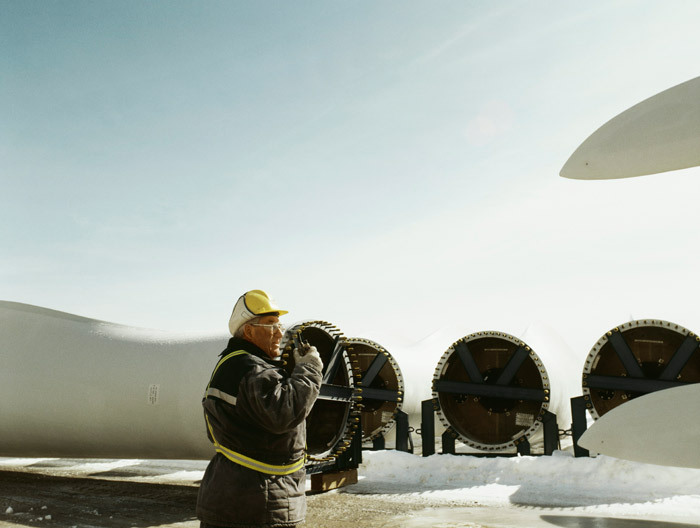 We are hopeful of more demand in Canada as wind energy grows here and committed to delivering a return on this investment by developing the skills of all current and future employees in the region of Gaspésie-Îles de la Madeleine." The package announced includes a $ 4.3 million loan from the Ministry of Economy, Science and Innovation and a grant of close to $ 1.4 million from Emploi Québec for skilled technical training of workers. The announcement was made last week by Minister of Economy, Science and Innovation and Minister responsible for the Digital Agenda, Dominique Anglade, accompanied by the Minister of Energy and Natural Resources, Minister Responsible for the North Plan and Minister responsible for the North Shore region, Pierre Arcand, and Minister of Education, Recreation and Sports, Minister of the Family and Minister responsible for the Gaspésie-Îles de la Madeleine, Sébastien Proulx. The investment project will allow, among other things, LM Wind Power Canada to manufacture high quality blades for wind turbines for Canada and the US market but it also ensures the facility is open for new business from additional customers in future. Marc de Jong, LM Wind Power CEO, joined the presentation in Gaspe via teleconference. "Our success in Gaspe sends a strong signal about the increasing viability of wind energy and renewables within the overall energy mix. We are strongly encouraged by the remarks of our visionary government partners in Quebec and call upon them to look again at the opportunity investments like this can create. It is exciting to see that they recognize the affordability and viability of wind energy. We want to collaborate further and fully realize the opportunity this represents for the wider economy. We have the technology, the talent is there to be developed and through teamwork we can bring more clean and reliable energy to the whole country," Marc de Jong said. Founded in 2005, LM Wind Power Canada is a subsidiary of the multinational LM Wind Power located in Denmark. As a result of this expansion project, the company will have 450 jobs in the Gaspésie-Îles de la Madeleine region by 2018. LM Wind Power is the world's largest designer and independent supplier of rotor blades for wind turbines, with a global manufacturing footprint that includes blade factories in Brazil, Canada, China, Denmark, India, Poland, Spain and the United States. The company has produced more than 185,000 blades since 1978, corresponding to more than 77 GW installed capacity and global savings of more than 147 million tons of CO2 annually.